Seven years of driving a Nissan Leaf. The good, the bad, and how it has aged. On May 18th of 2011, I took ownership of a Nissan Leaf. The car that would eventually be mine was one of the first 2000 that Nissan produced. My car left Japan just hours before the Tōhoku earthquake and tsunami devastated the island country. When the car arrived, I had no regrets. I fell in love with the smooth quiet peppy acceleration. I took friends and coworkers out for ride-&-drives and a few of them were soon owners too. For commuting and running errands, this car was great. The range at in-town speeds is much better than the freeway speed range. For trips in the 50 to 100-mile range, you could make it work given the right infrastructure and a little patience. Anything beyond that was asking more than the car is designed for or my patience would usually allow. But that's Okay, any vehicle supports only a limited set of cases where it works well. You would not take a sports car to haul lumber or a truck and trailer to the racetrack. Cars work best when you use them in cases they are well designed to accomplish. For this car, that meant local trips. This was my commuter car and it worked great for that. We did sneak in a couple longer trips too. 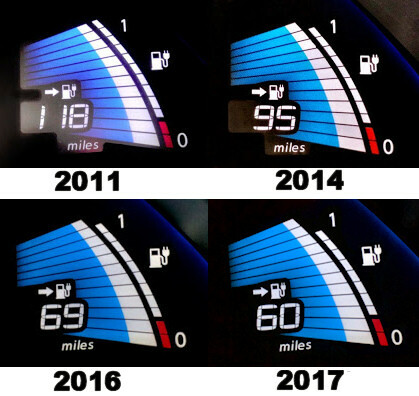 The range, as reported by the car, is shown in the images below. The range that the car reports is not very reliable. The estimate is based on your recent driving style and road conditions. You could coast down a long hill and have this range estimate increase far more than it should based on just the energy regenerated. For example, the 118 miles as reported in 2011 was never a possibility under real driving conditions. This is one reason that some Leaf owners refer to this gauge as the Guess-O-Meter. I expected some degradation in the first year. That's normal. 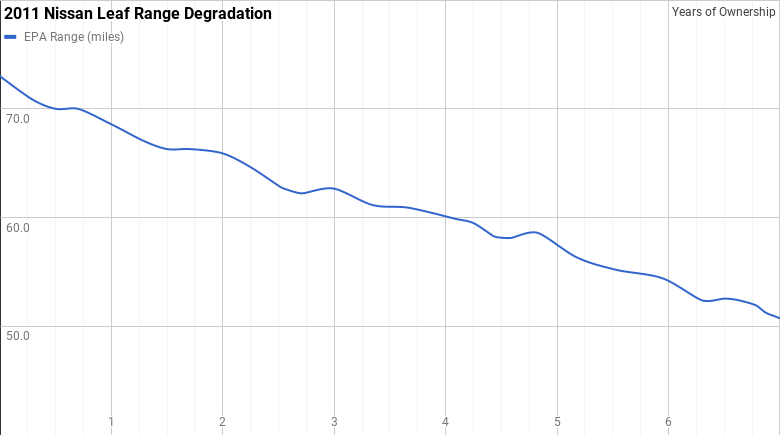 However, I expected the degradation to level off and be very gradual thereafter. Unfortunately, as you can see in the graph below, we've had notable, nearly linear, range loss each year. There is some minor noise in the graph from seasonal temperature changes, but the trend is clear and still heading down. With ~50 miles of range, the Leaf is never too far from home nowadays. This has been my biggest disappointment with our long-term ownership. I wanted this car to last 10 years. Nissan has done little to resolve the Leaf degradation problem even in the current 2018 Leaf models. Our Leaf has 57,408 miles on it. This is an average of only ~8,200 miles per year. And this car was not in southern California or Arizona, it was in Oregon where we have great weather for Li-ion batteries with very few days each year over 100 F and very few below freezing. The only consolation that Nissan offers is “refabricated” packs at a discount. This program started this month in Japan and should be rolling out to the rest of the world soon. The refabricated packs cost $2,850 USD. For comparison, new packs cost $6,200 USD for 24 kWh; $7,600 USD for 30 kWh; and $7,800 USD for 40 kWh. This allows you to extend the life of your car, but the fundamental cause of the degradation is still there. Nissan had a lead in the affordable battery-powered electric vehicle (BEV) market. The Leaf started selling 18 months before the Tesla Model S came to out in June 2012, and the Leaf was at a much more accessible price. In 2013, the Leaf was the best selling BEV, beating offerings from Mitsubishi, Ford, Honda, Tesla, and others. In 2014, the Leaf even outsold the Chevy Volt making it the best selling plug-in car in the US. Then in 2015, things changed. 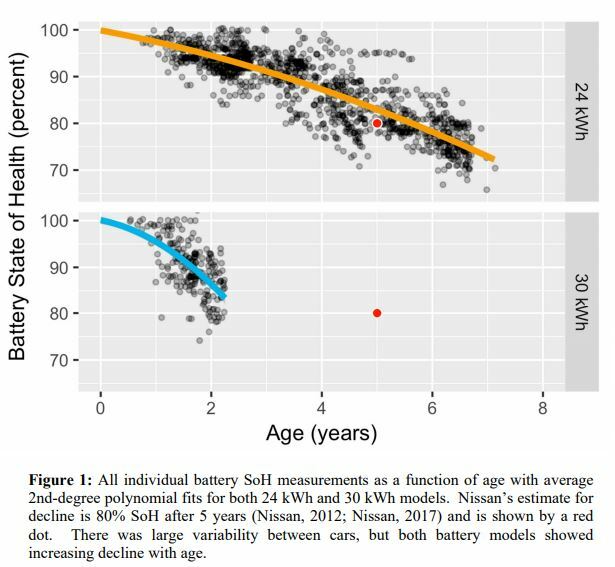 Soon after the Leaf began sales in hot climate states like Arizona, some people started to notice that their batteries were quickly degrading. Nissan did not have a liquid-cooled thermal management system in the Leaf. After this problem came to light, Nissan did not redesign their pack to use an advanced liquid-cooled thermal management system. Instead, they made changes to the battery chemistry to attempt to make it more heat tolerant. The anecdotal reports on the Leaf forums said that these new batteries degraded just as fast as the old batteries. Many potential buyers (especially in warmer climates) lost faith in Nissan's EV program. In 2016, Nissan bumped the battery pack capacity up to 30kWh, up from the previous 24kWh. In 2018, Nissan again bumped the pack capacity, this time to 40kWh. In both cases, Nissan opted to not install a liquid-cooled thermal management system. With more battery capacity, comes more heat; more heat means more degradation. How would these new packs age? Now, two years later, we know the results from the 2016 upgrade. Green Car Reports quotes a study that states that the 30kWh pack declines at 3 times the rate of the 24 kWh pack. Note that I (and many others) were already disappointed with the degradation rate of the Leaf. And now, in a newer car, it was even worse! And how will the 40kWh pack perform? Nissan has taken steps to slow the degradation, but you might not like their solution. In the 40kWh cars, Nissan throttled the rapid charging rate. This was dubbed RapidGate by Transport Evolved. Slowing the charging rate limits the usefulness of the car for things like road trips. If you are just using the car for short trips, this is not a problem, but potential buyers need to understand the limitations or they might be severely disappointed with their purchase. If you are considering a Nissan Leaf, I'd lease it rather than buying, at least until Nissan has a car with a proven long-term track record. 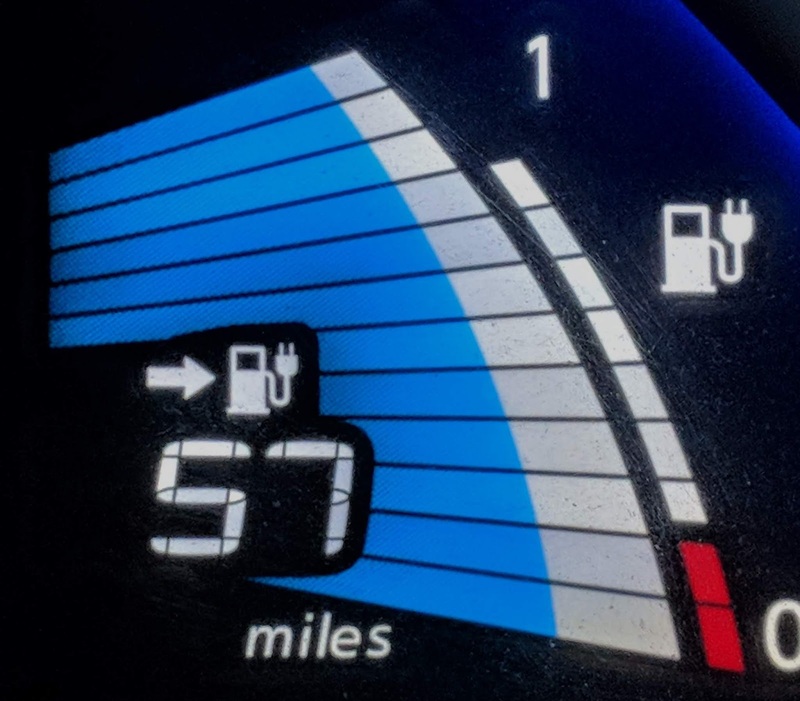 A lease will allow you to own the car for a few years, a time period well within the battery lifespan before there is significant cumulative degradation, and then walk away from it as the batteries slump. Another option to consider is a used Leaf. It would certainly have some range loss, but as I said above, if you are aware of the limitations and only plan to use the car in a manner consistent with its capabilities, then you can likely pick up a used Leaf on the cheap and replace the battery pack if/when you need to. Nissan sold off their battery division in 2017. PushEVs reports that the 2019 Leaf will use an LG Chem cells similar to those in GM vehicles. With these new cells, I assume that Nissan will finally install a liquid-cooled thermal management system and uncork the rapid charging rate. We'll find out later this year. A new electric car will take the Leaf's charging spot in our garage this year. We have a day-1 reservation for a Tesla Model 3 and we plan to trade in or sell our Leaf. Tesla's vehicles have had long-term studies that show 90% capacity remaining after 150,000 miles. We excepted to keep our Leaf for 10 years; with the degradation rate we're experiencing that is no longer an option. Perhaps the Model 3 is a car that will go the distance. Nissan had an early lead in the affordable electric car market. When stepping into a new technology, issues are common. The important thing for a company to do is to acknowledge the issues and rapidly make improvements. Nissan did not do this. They stubbornly stuck to their inferior thermal management system despite the clear evidence that it was producing poor battery life. It's disappointing to see them squander the early mover advantage that they had. This was the first Nissan that I had ever purchased. Initially, for several years actually, I loved it. If things had gone differently, they could have had a customer for life. Instead, my next car will bear a different badge. I hope the 2019 Leaf has much better long-term reliability and that Nissan can maintain some of the goodwill that they built with the Leaf. You can read my 6-year review here.